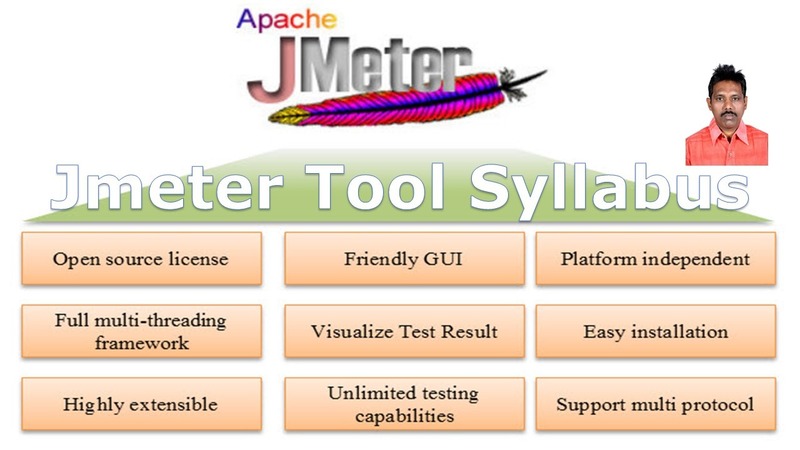 Apache JMeter Syllabus for conducting Web page , Database server, FTP, JMS and Web Services Performance Testing. > Independent Testers conduct Performance Testing at System Testing Level using Black Box Test Design Techniques. > We have different types of performance Testing like Load Testing, Stress Testing, Spike Testing, Endurance Testing, and Volume Testing. 3) How to conduct Performance Testing? > Generally Software Testing can be done in two ways, 1) Manual Testing, 2) Automated Testing, but Manual Testing is impractical for Performance Testing and Automated Testing is only possible. > Identify the Testing Environment, Identify Performance Metrics, Plan and Design Performance Tests, Configure the Test Environment, Implement your test design, Run / Execute Tests and Analyze, tune and retest. 1) What is Apache JMeter? > Apache JMeter is an open source, 100% Java based application with a graphical user interface. 4) How does JMeter Work? Download Jmeter and unzip and Launch / Start JMeter. > A Thread Group is a set of threads executing the same scenario. Virtual user groups are represented by Thread Groups. > JMeter has two types of Controllers: Samplers and Logical Controllers. These drive the processing of a test. > Samplers tell JMeter to send requests to a server and wait for a response. Ex: FTP Request, HTTP Request, JDBC Request and JMS request etc. > Logic Controllers let you customize the logic that JMeter uses to decide when to send requests. > Listeners are the JMeter component that displays test results. > By default, a JMeter thread executes samplers in sequence without pausing. We recommend that you specify a delay by adding one of the available timers to your Thread Group. > Assertion in JMeter is used to validate response of the request, that you have sent to the server. Assertion is a process where you verify expected result with the actual result of the request at run time. > Config elements in JMeter are used to configure or modify the sampler requests made to the server. They do not send requests, configure or modify the sampler requests. > PreProcessors are JMeter elements that are used to execute actions before the sampler requests are executed in the test scenario. > A test plan describes a series of steps JMeter will execute when run. A complete test plan will consist of one or more Thread Groups, logic controllers, sample generating controllers, listeners, timers, assertions, and configuration elements. > Running a test plan is only 50% of the performance testing task. > The most challenging part of the performance testing process is the analysis of test results and the identification of bottlenecks. > Listeners are most important part of JMeter’s test plan as users can only see the results of their samplers by making use of listeners. > Build a simple test plan which tests a web page. We write a test plan in Apache JMeter so that we can test the performance of the web page. > Create a test plan to test the database server. > Create a Test Plan to test the FTP site. > Create a test plan to test Java Messaging Service (JMS). > Distributed testing enables having a local JMeter (master) that handles the test execution, together with multiple remote JMeter instances (slaves) that will send the request to our target server. > Variables can store some values which you need in different places of you test. > Regular Expressions are a tool used to extract a required part of the text by using advanced manipulations. > Your hardware capabilities as well as the Test Plan design will both impact the number of threads you can effectively run with JMeter. > Use non-GUI mode, use as few Listeners as possible; only save the data that you need, use as few Assertions as possible. > This functionality allows changing parameters in multiple places of the Test-plan. > Once you reach the limits of one machine, you can switch to distributed or remote testing. > The BeanShell interpreter has a very useful feature – it can act as a server, which is accessible by telnet or http. > Often it is useful to be able to re-run the same test with different settings. For example, changing the number of threads or loops, or changing a hostname. Independent Software Testers conduct Performance Testing (Test Type) at System Testing Level using Black Box Test Design Techniques. > Manual Testing is impractical for conducting Performance Testing and Automated Testing is only possible. > Micro Focus LoadRunner, Apache JMeter, IBM Rational Performance Tester, Silk Performer, WebLoad, NeoLoad are the Popular Test Tools in the IT Industry. > Apache JMeter is an open source Software, 100% pure Java Application and supports multiple operating environments like MS Window, Macintosh and Linux etc. Using JMeter we can Test Computer Web Applications and Mobile Web Applications. > JMeter is a protocol based test tool, supports different types of protocols, using JMeter we can conduct Web Application Performance Testing, Database Server Performance and Web services. > We can easily setup JMeter Test Environment on any operating environment and Environment setup is same for all operating environments and only difference is launch/start JMeter. After Launching the JMeter then usage of JMeter also same. Since It is a Pure Java Application then Java Installation is required to run JMeter Software.